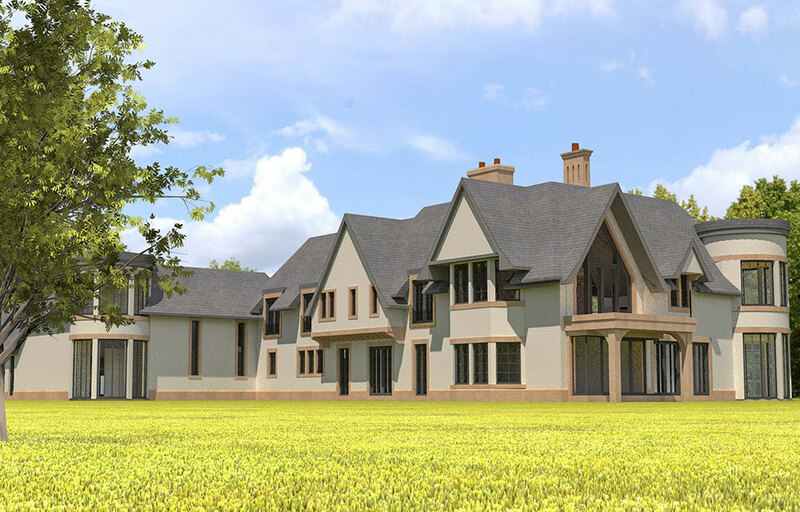 NC Architecture have designed a magnificent new home for our Client and his family, on an extensive 0.862 hectare plot within the Caldy Conservation Area, on The Wirral. This prominent plot has combined four historical parcels of land, which included a 1930s cottage previously built as a caretakers lodge. We worked closely with the Local Authority Planning and Conservation Team, to secure approval following a positive Pre-Application consultation process. The result is a well-considered scheme, which responds to its natural topography and context. This 1,350sqm / 14,500sqft family home caters for a specific requirement of a 25m x 8m swimming pool and outdoor tennis court, yet the building sits comfortably and sympathetically on the site and retains the character of the Conservation Area. The three distinct blocks of the built form are made up of the main dwelling house: open plan kitchen and dining room leading through to a day room. Formal dining, formal lounge, study, feature galleried staircase. Leisure Suite, swimming pool, steam and sauna, bar / lounge area off Jacuzzi. Gym and games room on mezzanine overlooking the pool. Garage: space for three cars, boot room, den / games room above and music / cinema room beneath. The ‘Arts and Crafts’ style dominates throughout the estate. 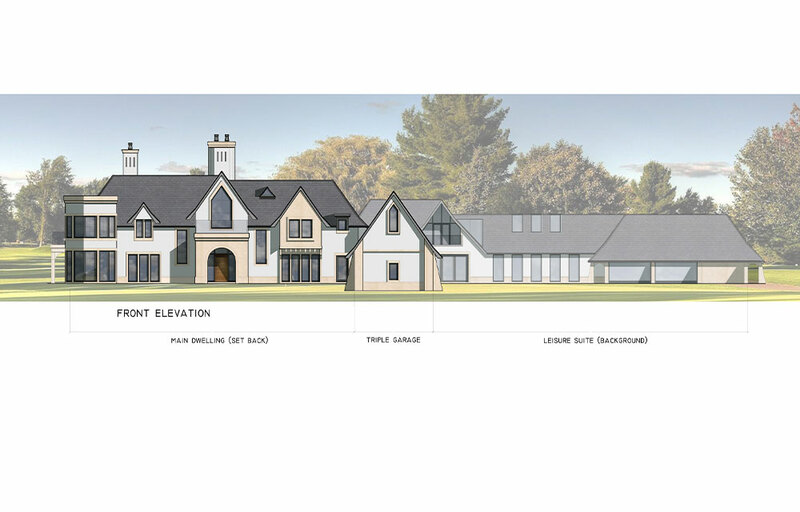 The scheme has been designed as a contemporary interpretation of this style, a traditional vernacular, which uses historic features and forms and locally sourced materials detailed and re-engineered in a contemporary way. 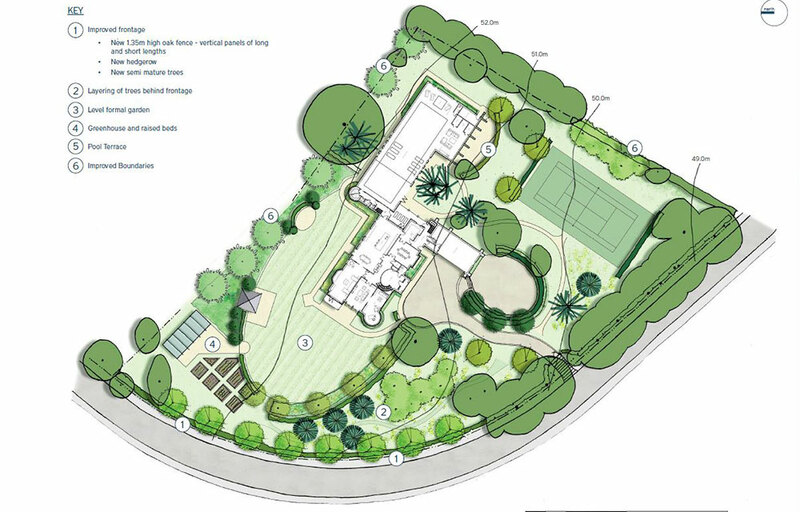 The plan form is free-flowing with use of balconies, terraces and loggias, to reinforce its relationship to the extensive grounds and landscaping. Large feature round bay windows on the corner, in addition to projecting bays, appear on multiple elevations creating visual interest from all vistas.